National Public Radio story on Backyard Music Dulcimers. Third graders build Backyard Music Dulcimers in Dallas. We've designed our instruments and instrument kits to be as affordable and as easy to assemble as possible - without sacrificing any playability. As musicians, we build harps, dulcimers, and banjos of a quality that we ourselves enjoy playing at home, around the campfire, and in the classroom. Many Backyard Music instruments become lifetime companions for the people who buy or build them. Action refers to the distance between the string and the frets/fingerboard. If the action is too low, strings buzz. If the action is too high, the instrument is unnecessarily difficult to play and sounds out of tune when played up the neck. We carefully adjust the action on all our assembled, and look over each and every kit we send out to make sure that it will easily assemble with good action. All our banjos and dulcimers use geared tuning machines with a 14:1 gear ratio. This makes the tuning process smooth and easy. Our tuners won't slip, so once the strings stretch out our instruments generally stay in tune. Good geared tuning machines are expensive, so many inexpensive instruments use inferior friction pegs or geared tuners that slip. Low quality tuning pegs make tuning difficult (especially for novice musicians), and it's no fun for anyone to try to play an instrument that keeps going out of tune! Our harps use the standard zither pins and nylon harp strings spaced the usual distance apart. If fret and bridge placement isn't exact, an instrument will play out of tune no matter what you do. Over time, string tension can cause wood to bow or warp. This is particularly likely to occur when cheaper soft woods are used. We use Nicaraguan mahogany for our banjo necks and dulcimer fretboards, and maple for our harp frames. Treat them right and our instruments will last you a lifetime. To keep costs low and the building process simple, we make a few material substitutions that don't affect playability. For example, our dulcimers and harps have hollow soundboxes made of corrugated cardboard. Why cardboard? Tear apart your stereo speaker and you're likely to find a cone of cardboard around an electro-magnet. Wooden soundboxes can crack when exposed to sudden temperature change or extreme humidity (low or high). Cardboard is nearly impervious to weather conditions. When painted, it can even get a little wet--the water will bead up and you can wipe it away. With their folded edges and trapezoidal shape, our soundboxes are very strong. If you knock your instrument off the table it might get a small dent or crease, but the top won't split. In some classrooms, a set of our dulcimers is still going strong after twenty plus years of near constant use. Occasionally, schools that ordered a few decades ago get ready for replacement bodies. They tear off their old soundboxes and we send them new ones to glue back on--cardboard doesn't cost a lot! Light instruments are a big plus for travelers, backpackers, itinerant music teachers, and elementary school children. Out banjos and dulcimers weigh less than two pounds each. Paint it, fold it along the creases, and glue it up with Elmer's glue. A class of 30 5th graders can build their dulcimers in a few hours. 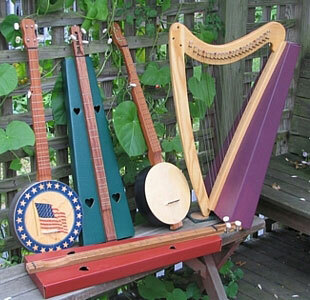 Our harps and banjos are also designed for quick and easy assembly.